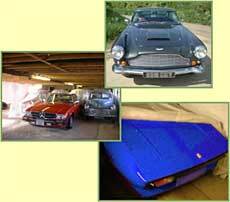 Discreet, secure storage for modern and classic cars and motorcycles. UK wide enclosed vehicle transportation. Comprehensive insurance cover during storage and transportation. Exercise and maintenance programs tailored to individual requirements. Long or short term storage. Air chamber storage available upon request. To have been the first storage and transportation company to become a trade supporter of the Federation of British Historic Vehicle Clubs, and we fully support the aims of this organisation. A well established company, owned and run by classic car enthusiasts with many years experience of professionally caring for classic and modern prestige cars and motorcycles. We offer a storage and transportation service that can be tailored to individual requirements, for all kinds of vehicles from priceless classics to the most 'ordinary' modern car. Our list of clients has over the years included, among others: Classic Cars Magazine, The National Motor Museum, classic car & bike auctioneers, TV & film production companies, classic and prestige car dealers, race teams and 'blue chip' companies, as well as individuals and collectors from all over the world. Our tariff outlines our services and charges but please contact us to discuss your particular requirements. We provide transportation for vehicles throughout the UK and beyond, and if you wish to sell or purchase a vehicle we can also be of assistance; please view our vehicles for sale page. On our links page you can find links to other websites that we feel may be of interest to classic vehicle owners and enthusiasts and in our gallery you can see some pictures of us 'in action'. Our site is written to be as accessible as possible for everybody. If the text on our site looks too small, please use the Text Size setting (or equivalent) in your browser to make it larger. If you have problems with this or any other problems accessing the content on our site please contact us.